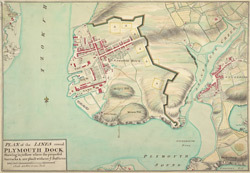 Plan of the Plymouth Dock in Devon. This is the point where the rivers Tamar, Tavy and Lynher enter Plymouth Sound. Proposals for a dockyard here were first proposed by Sir Francis Drake in the late 16th century. It was felt that the broad estuary afforded excellent natural protection however it was not until 1690 that work began on the dock. William III appointed Edmund Dummer, surveyor to the Royal Navy, to build what became known as Plymouth Dock. By the 19th century Plymouth Dock was actually bigger than Plymouth itself and in 1824 it became independent, the town and the dockyard becoming known as Davenport. This is now the largest naval base in Western Europe. This plan, which dates from 1756, shows the site for the proposed barracks.